Notes: If you don’t have a food processor some milling with a knife will get the cauliflower florets small enough. Preheat the oven to 400 degrees F. Spread the chickpeas out on a parchment lined baking sheet. Sprinkle them with a bit of lime zest, chili powder, salt, pepper, and about a tablespoon of olive oil. Toss the chickpeas to coat and slide the tray into the oven. Roast until lightly crispy and golden, about 15 minutes. Start turning the cauliflower into rice in batches. Place a few handfuls of the florets into the bowl of a food processor fitted with the “S” blade. Pulse the florets until you have small, rice-ish bits of cauliflower. Scrape the “riced” cauliflower into a large bowl. Repeat with remaining cauliflower. Whisk together the remaining lime zest, lime juice, a little splash of water, some salt and pepper, the grainy mustard, maple syrup, and 3-4 tablespoons of olive oil. Pour it over the cauliflower rice and toss to coat. 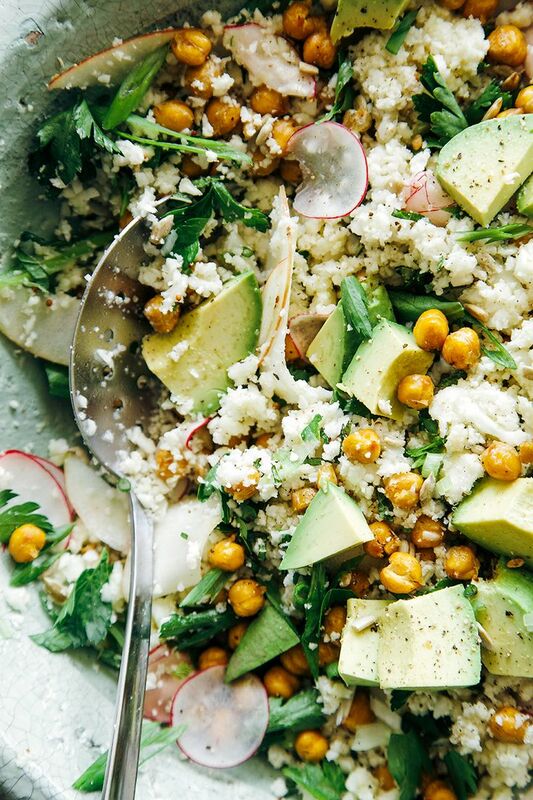 To the large bowl, add the radishes, parsley leaves, mint, scallions, chives, sliced apple, and roasted chickpeas. Toss it all lightly to combine. Top it all of with the diced avocado, sunflower seeds, and some more salt and pepper.